The Rail of Tomorrow: "Yeah, well, I didn't get it, did I?" "Yeah, well, I didn't get it, did I?" Five Easy Pieces (Bob Rafelson, 1971) is, for me, the definitive film of the 1970s. It's not the best film made during that time - Barry Lyndon, Days of Heaven, The Last Picture Show, and everything Coppola made are all more accomplished films - but it perfectly surmises what people are talking about when they're talking about film in the '70s. And it is just such a great, and in its own way very heartfelt film. Five Easy Pieces is the kind of film that almost never happens anymore. And I don't mean that bunk that baby boomers won't quit talking about, that "movies were just better back then! They had stories! Now you just have effects!" No, I mean a movie that completely and totally made a star of its lead. Stars nowadays, if there are any left, come up slowly through the ranks until suddenly we all know who they are. Or, increasingly, we get stars whose names we know but whose work, if they've done any, we cannot name. 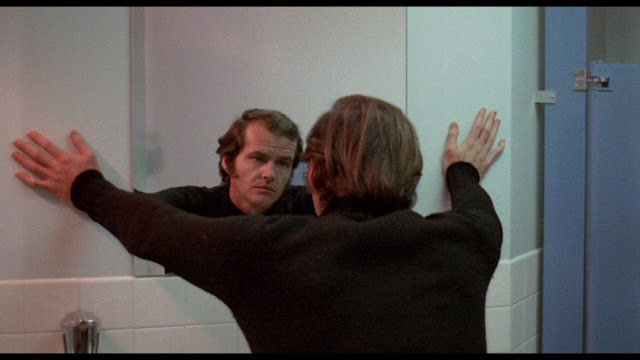 Jack Nicholson was on the public's mind after Easy Rider, but every second of Five Easy Pieces makes him a star. He takes all the attention-grabbing personality he displayed in the former and builds a character, a kind he will revisit constantly throughout his career and will lead more shortsighted viewers to declare "he's not much of an actor, he just plays the same guy over and over." The latter might be true, but he invests that guy with so much depth and charisma, and what exactly are we doing watching actors anyway if not to see some element of truth buried in performance? Nicholson always managed to find that truth, and here, as Bobby Dupea, is where he discovered it. Click here to read the rest at Battleship Pretension. Scott Nye loved movies so much, he spent four years at Emerson College earning a career-free degree in Media Studies. Now living in Los Angeles, he's trying to put that to some sort of use. "Sometimes, Children Are Bad People, Too."